Today’s post offers a short roundup of the day’s business news, and focuses upon the stories of George Osborne taking up the position of Editor of the London Evening Standard Newspaper, and of the news that former Barclays Chief Bob Diamond is returning to the City of London by purchasing the venerable British Broker Panmure Gordon. In a previous post in Financial Regulation Matters, the focus was on George Osborne’s monetising of his previous position as Chancellor of the Exchequer, mostly by way of his new role with the giant investment firm BlackRock which will see Osborne pocket £650,000 a year from that role alone. It was discussed that Osborne is embarking upon a conscious and concerted campaign to turn the influence that he wielded as the architect of austerity into considerable compensation, and the next stage of that campaign was revealed today. It was announced that Russian Billionaire Evgeny Lebedev has installed Osborne as the Editor of the London Evening Standard Newspaper. Whilst his salary has not been revealed, it is logical to conclude that it will be much more than his £75,000 salary he receives as an M.P., but in truth it is the influence that he can now wield and the fact he is a current sitting Member of Parliament that has attracted the headlines today, with one newspaper suggesting that the position gives him the basis to seek ‘revenge’ for the undignified way he was side-lined upon Theresa May’s arrival at the helm. 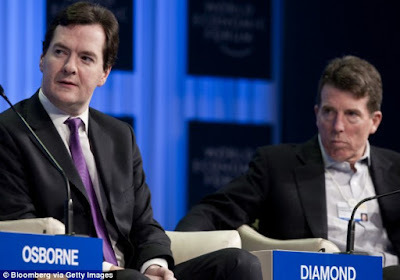 Nevertheless, what is clear is that the title of the previous post – the art of monetising your position – was an incredibly apt moniker; Osborne is demonstrating, in the truest possible sense, what can be done when you are willing, in an almost Faustian manner, to ‘call in your chips’. Osborne’s tenure at the helm of the Evening Standard will surely be an interesting one. In 2012, Bob Diamond resigned from his position as CEO of Barclays Bank in light of the rate-rigging scandal that engulfed the British bank. The bank, under his stewardship, had consciously sought to manipulate the LIBOR rates, a rate which essentially acts a benchmark for a range of financial deals and can be recognised as a ‘measure of trust in the financial system’; the bank was ultimately fined £284.4 million by the Financial Conduct Authority and over £1.5 billion when fines to other regulators were totalled. After 15 years with the bank, and only 18 months as CEO, Diamond, who had rose to prominence because of his work with Barclays’ investment divisions, left after extreme pressure from external forces, including the now-defunct Financial Services Authority and the Bank of England, and ultimately left the City as a result. However, today, he meekly returned. Diamond, as part of his buyout vehicle Atlas Merchant Capital, has teamed up with QInvest, investment vehicle for the Qatari Royal Family, to purchase the stricken stockbroking firm Panmure Gordon in a move which values the firm at £15.5 million. Whilst the sums involved are low for players of this calibre, the return of Bob Diamond from the wilderness, at the same time we are expecting Theresa May to trigger Article 50 and begin the formal secession from the E.U., will be a welcome shot in the arm for British politicians who are keen to promote the health and future of the City in response to the manoeuvrings in Paris and Berlin, as was discussed in a previous post. However, the analogy that circling sharks are rarely a positive sign can be attributed here – Diamond has demonstrated, even admitting before committees, that he actively engaged in unethical practices to promote the financial health of his companies and, ultimately, his own position; Diamond’s return then, unfortunately, adds fuel to the theoretical fire that the decision to leave the E.U., rightly or wrongly, will coincide with the reduction in supervision… it is hard to believe that Diamond’s reappearance is purely a coincidence. There is an extremely limited amount of impact he can make at such a small firm, but his quiet reintroduction to the City represents the opening act of a story that is beginning to build and build and which may not have a happy ending. Labels: Bob Diamond, George Osborne, London Evening Standard, Panmure Gordon.